Williams College, with an annual freshman class of 2000, is the reason the town exists. It's a beautiful, delightful example of the New England rural college town, but with several world-class art museums. Williamstown (population 8500), 140 miles (225 km) from Boston in the far northwest corner of Massachusetts (map), is at the northern end of the Berkshire Hills. 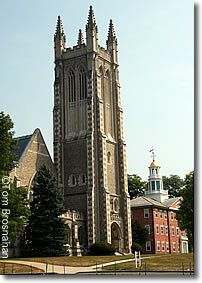 It boasts renowned Williams College and two fine art museums. Williamstown was founded in 1753 as West Hoosuck, but its life and its name were soon affected by the career of Ephraim Williams, Jr, a soldier in the British colonial army. Born in 1714, Williams surveyed several townships in these parts, then took command of fortifications which demarcated the frontier between the British and French North American empires. Among these defenses was Fort Massachusetts, which stood in North Adams. Williams led a column of troops from Massachusetts toward the French positions on Lake George, and died in the fighting (1755). His will provided for the founding of a school in West Hoosuck, but only if the town took his name. It did, and Williams College enrolled its first students in 1793.